We are pleased to announce our first Holiday Small Works Show in the gallery at The Switchboard, featuring artwork from artists from the Merrimack Valley and beyond! This soon-to-be-annual show will offer our community the opportunity to purchase artwork at affordable prices and form relationships with local, working artists. This years’ opening was held on Friday, November 2nd, and we’re proud to announce it was our most well attended event to date, bringing together Haverhill residents and beyond! Kicking off the 2019 Gallery Programming at The Switchboard is Greg Moutafis, a Merrimack Valley- based artist working in a variety of media including illustration, cartooning, design, and painting. A graduate of the Massachusetts College of Art, he has illustrated projects for a diverse group of publishers, agencies, and colleges, in addition to years of commissioned work for private collectors. Included in the show are original sequential art and illustrations, prints, framed wall art, and copies of the artists’ recently published graphic color graphic novel, “Boom!Squad”. 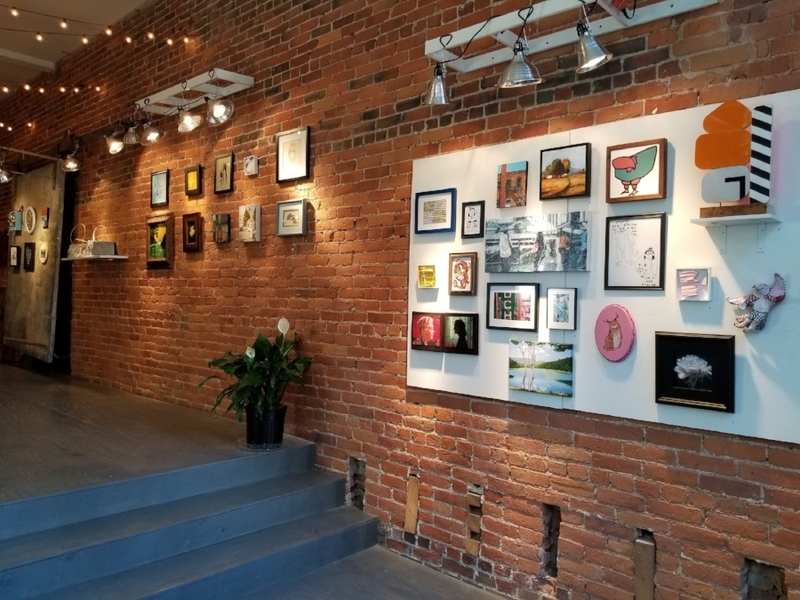 See you at the Gallery to enjoy Haverhill’s spectacularly diverse art scene! 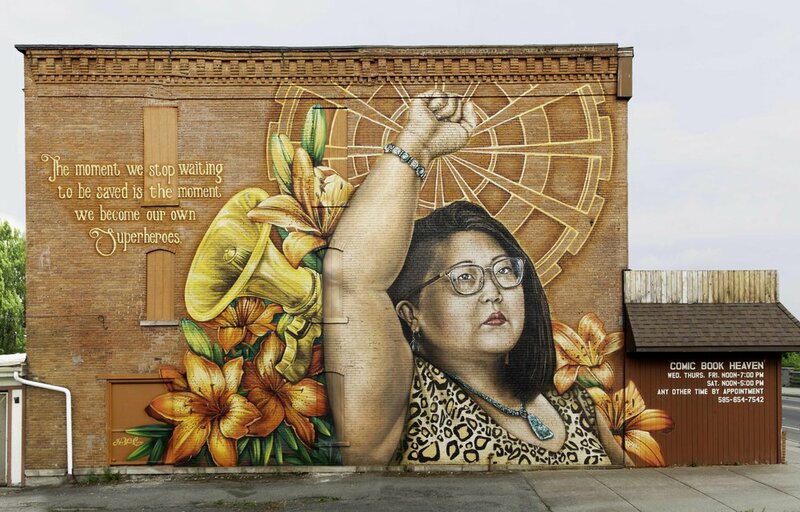 The Switchboard is proud to present Her Voice Carries, a mural project by Rochester, NY- based artist, Sarah C. Rutherford. We will be exhibiting Rutherford's artwork and assemblages in the gallery as she paints the first in a series of national murals here in downtown Haverhill. We are pleased to welcome the mixed media work of Joe LoVasco into The Switchboard! This body of work represents early experiments in collaging beginning in 2013, when LoVasco started to refine his colored pencil and scored paper collages down to abstract shapes. Considered by the artist to be "drawings," LoVasco's work is a unique, warm introduction into the joys of abstract work. LoVasco is also currently exhibiting a new body of work at Gentile Brewing Company in Beverly, MA. Check out SJ Art Consulting's site for more information. Artists Amy Titus, Madison Safer, and Natalie Kassirer stand in front of their work in the gallery. Kassirer, Safer, and Titus bring a unique presence to the gallery walls of The Switchboard. Though varied in style, their work seems to intersect through the play with and exploration of the blurring of boundaries between the animal kingdom, ourselves as humans, and our oft precarious relationship to nature. We are honored to present their inspired illustrations to the community of Haverhill. All work is available for sale and can be viewed during our gallery hours, Thursdays 5-8pm and Saturdays 10am-1pm, or by appointment. The Switchboard is proud to announce our first exhibiting artist, Brian Canty. Brian is a Haverhill native who works primarily in watercolor. His paintings depict rich landscapes infused with a visceral sense of familiarity, based in part by his keen appreciation for our unique NewEngland backdrop. "Cool Stretch," 2017. Watercolor on Arches paper.